The Rockwell XFV-12 was a prototype supersonic United States Navy fighter which was first built in 1977. The XFV-12 combined the Mach 2 speed and AIM-7 Sparrow armament of the F-4 Phantom II in a VTOL (vertical takeoff and landing) fighter for the small Sea Control Ship which was under study at the time. On paper, it looked superior to the subsonic Hawker Siddeley Harrier attack fighter. However, it proved unable to produce enough thrust for vertical flight, even with an installed engine with more thrust than its empty weight, and the project was abandoned. The Marines had adopted the British-designed Harrier, the only truly successful V/STOL design of the 1960s. Its replacement, the F-35B Lightning II uses a shaft-driven fan and a swivelling rear nozzle to achieve vertical landing. It is designed for supersonic and vertical flight with performance just over Mach 1.5 with weapons and range comparable to the older F-4 and F-18. In 1972, the Navy issued a request for proposals for a next generation supersonic V/STOL fighter/attack aircraft. The XFV-12A, despite its concept being considered risky compared to that of the Harrier, was selected for development. To reduce costs, the nose from an A-4 Skyhawk and intakes from the F-4 were used. Engine rig testing began in 1974. Free-flight model tests conducted at the NASA Langley full-scale wind tunnel showed the projected thrust augmentation levels were highly optimistic, and that the aircraft would most likely be incapable of vertical flight on the thrust available. However, the model's configuration did prove suited for conventional flight. The XFV-12 used a thrust augmented wing concept in which exhaust would be directed through spaces in a wing opened up like venetian blinds to increase available lift, somewhat like Lockheed's unsuccessful XV-4 Hummingbird. Such arrangement restricted weapons carriage to under the narrow fuselage and two conformal missile mounts. Its canards were extremely large, with almost 50% of the area of the wings, making it effectively a tandem biplane. The 30,000 lbf (130 kN)-class afterburning turbofan engine had enough thrust to lift the weight of the 20,000 lb (9,072 kg) aircraft. It was modified to further increase thrust for vertical lift. The rear engine exhaust was closed and the gases redirected through ducts to ejector nozzles in the wings and canards for vertical lift. Tethered hover tests were conducted in 1978. Over the course of six months, it was determined that the XFV-12A design suffered from major deficiencies with regard to vertical flight, especially a lack of sufficient vertical thrust. Lab tests showed 55% thrust augmentation should be expected; however, differences in the scaled-up system dropped augmentation levels to 19% for the wing and a mere 6% in the canard. While the augmenters did work as expected, the extensive ducting of the propulsion system degraded thrust, and in the end the power-to-weight ratio was such that the engine was capable of vertically lifting only 75% of the weight of the aircraft in which it was mounted. 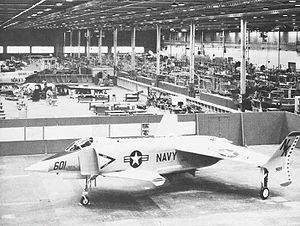 Following the tests, and with the program suffering from cost overruns, the Navy decided the XFV-12A was not worth further development, and cancelled the project in 1981. Aviation Week would later publish an article with drawings of an even more ambitious proposal to fit a similar wing to the huge C-130 Hercules, but the plan never made it off the drawing board. Of the two prototypes built, only one was completed, while the second prototype was cancelled. Willis, David (2006). "V for Variety, part one". Air Enthusiast (Key Publishing) July/August 2006 (124): 55-65. ISSN 0143-5450. Rockwell XFV-12 Pictures and Rockwell XFV-12 for Sale.